We had another ultrasound yesterday. It was a follow-up to check on an irregularity in her brain...and to also check her position. We didn't mention it when we first found out because we didn't want to cause worry when we didn't know for sure that there was something to worry about. She had choroid cysts in her brain at 20 weeks...and so they wanted to check again at 32 and see if they were gone. They were! And she had flipped...she's on her side, but at least she's now head down. They also checked her measurements and growth. This is where it get's funny...and confusing. Back when I first discovered I was pregnant I figured a due date of February 24th. This was based on when I *thought* my last period was...I couldn't remember exactly, but I had a 3 day window and I picked the first day. When I saw the doc for the first time and they did a dating ultrasound they disagreed with the date...they did another a week later and pushed my due date back ten days to March 6th. I didn't agree with them - the timing for the making of said baby didn't line up - but they're the doctors so whatever. At my 20 week anatomy scan the sonographer measured and measured and said the baby was measuring with a due date of Feb 26th (which fit right into my three day window)...she was measuring big, but that was the date she was sticking with. I hadn't told the sonographer about the due date discrepancy until she mentioned a different date than the doctors had been saying. I let it be and figured it didn't matter much. Fast forward to this scan at 32 weeks. We were again told that she was big. Based on a due date of Feb 26th, our healthy baby girl was measuring in the 96%tile for weight...at an already estimated FIVE POUNDS! The sonographer (same as the first one) was quick to tell me that it is just an ESTIMATE and they can be off by up to a pound. 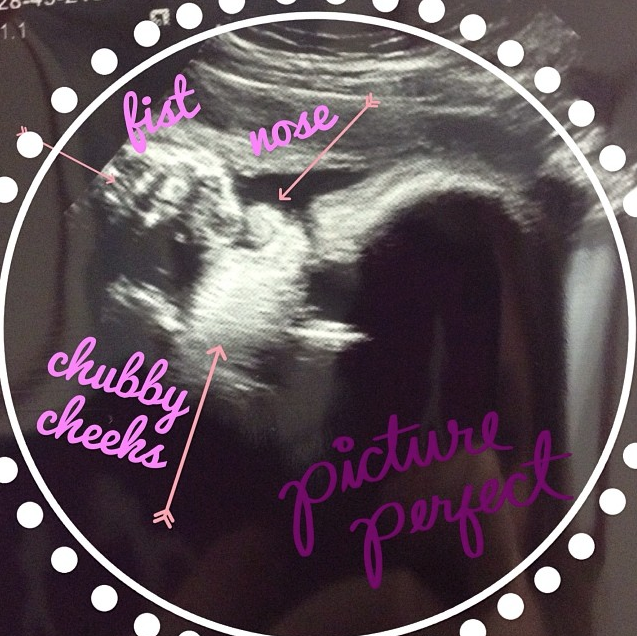 Baby was measuring right on target with height...but her head and belly were big. (Poor thing got my head instead of daddy's) My brain quickly remembered something I'd read that said that a baby gains a half to a full pound for their last 4-6 weeks in utero...and I did the math and my lady bits shuttered in fear. I asked what date she was measuring on target for...February 14th. That's when I'd be 37 weeks according to the doctors, and a couple days shy of 39 weeks according to me. So today when we met with my doctor I planned to ask him if he was going to move up the due date. He walked into the room and said "so did they tell you about your ultrasound results?" I responded with "yep, the cysts are gone"...and he said "No, that you're growing a heifer." WORD. FOR. WORD. Then he quickly apologized and said he shouldn't have said that...he grew up in the midwest around cows. It was fine with us - aside from the initial shock of having your doctor call your baby a large bovine animal. I quickly said "I prefer to think of her as my little linebacker" and we all had a good laugh. Have I mentioned before how much I love this OB?! He's from Chicago, he has a terribly dry sense of humor, and is brutally honest. He's perfect for us. Speaking of weight... I ask him about moving the due date and he checks back at the 8 & 9 weeks scans. Nope, it's staying. And then he tells me we shouldn't buy Newborn sized clothes...and laughs again. (in the most kind way possible...I promise) He does say that they will do another growth scan at 37-38 weeks to check her size. If she's measuring at or above 5000 grams (a little over 11lbs) they will schedule a c-section. If she's under they'll let me go. His big worry is having the baby get stuck in the birth canal...since the hospital here isn't equipped to deal with such an emergent situation. But he is very supportive and told me that my body was made for this and I'll be amazed at what it's capable of doing. He really is great. Everything else is going along swimmingly. I still have almost constant sciatica pain, and my hips feel like they want to separate from my body...both contribute to poor or little sleep; but I'm healthy and am genuinely enjoying being pregnant. I love having our time together...just her and I. Feeling her kick and roll and get hiccups is amazing. Last but not least - here's a pic of our little linebacker. It's a side profile shot or her with her fist in her mouth...where it has been EVERY time we've gotten a look at her. You can see her squinted eye, chubby button nose, chubby fingers, and those deliciously chubby cheeks.